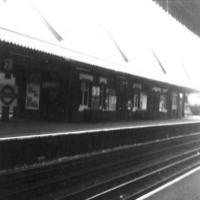 Amersham Station in December 1971. 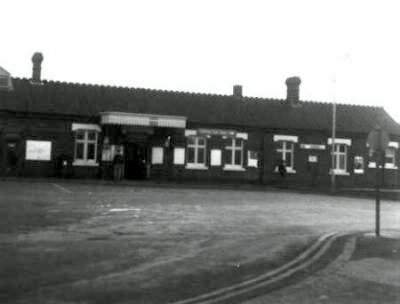 Not that different to today, although the ticket hall has been modified to incorporate automatic ticket barriers and ticket machines. the waiting room has also been removed to allow extra space for the ticket barriers. There is also today a division between Chiltern Avenue and the station forecourt to allow people to drop off and pick up and to allow taxis to park, however this can get very busy during the rush hour. Amersham station from Hyrons bridge with A60 stock train from London arriving. The sidings into the goods shed and coal yard have long been lifted. 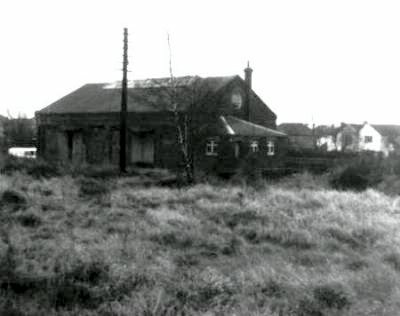 Where the goods shed is located in the picture above is now where the multi storey car park is and where all the trees and hedges are above is now housing. 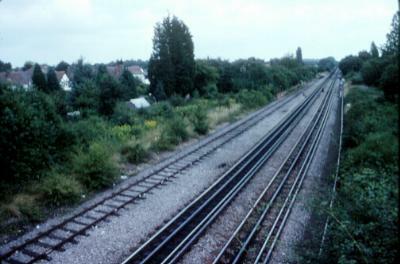 The siding on the right is still present and is used to turn around Chiltern services from Aylesbury when they don't run through to Marylebone. This used to be the case on Sundays, but now there is a service to Marylebone on Sundays. Apart from the siding to the goods yard removed from the right, there was also a goods loop to the left which ran parallel to platform 1. 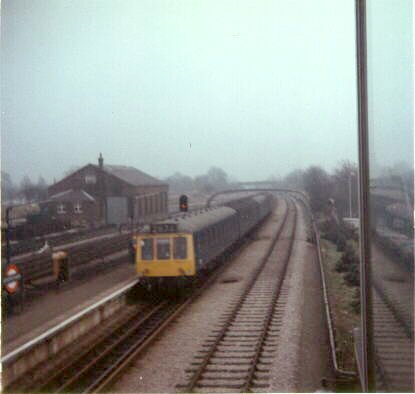 Similar view to above (actually taken in 1981) shows A60 stock leaving for London, about to pass under Hyrons Bridge. Over the past ten years or so, the view from this bridge has been obscured by mesh fencing placed on the parapet of the bridge. Another view from Hyrons Bridge taken in December 1971. 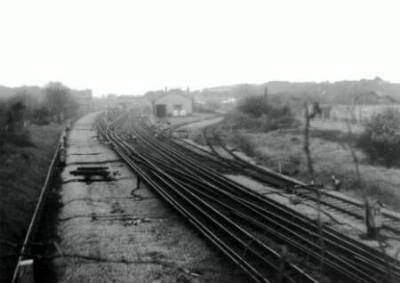 The sidings were still present and the fields on the right is now where housing, the health centre and new police building are. Until the building of the NHBC offices by the station, there used to be a cola merchants and London evening paper offices. 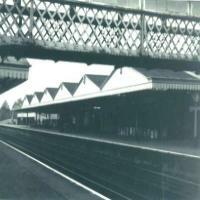 December 1971 views of platform 2 and 3 at Amersham. The footbridge used to have windows above the lattice so you could see the trains, this was replaced by plastic sheeting which is rather ugly and now quite dirty. 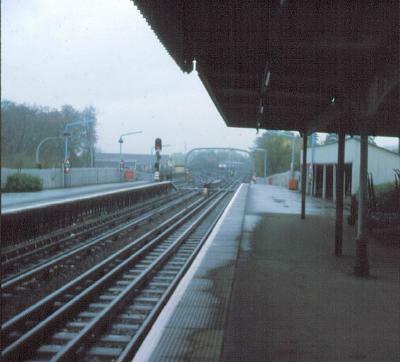 Looking towards Aylesbury from platform 3 in November 1975. An A60 train waits in the sidings. The cycle store was still accessed from the platform in 1975, today if you want to leave your cycle at the station you gain entry to the store via the old postage entrance, without entering the station. The vegetation at the end of platform 2 is almost non existent, unlike today where a large hedge blocks the views. 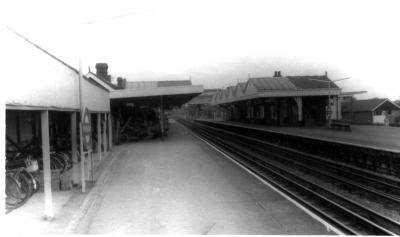 Amersham Station from platform 3 in 1974. The old cycle store is on the left and the gates beyond were still used by the Post Office and newspaper services, some trolleys are just visible on the platform. 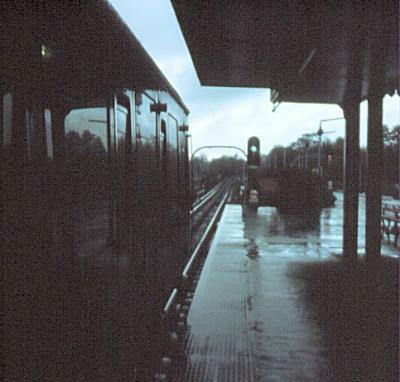 This picture taken from the signal box shows a British Rail D.M.U. bound for Aylesbury entering Amersham down road platform number 1 in 1969. 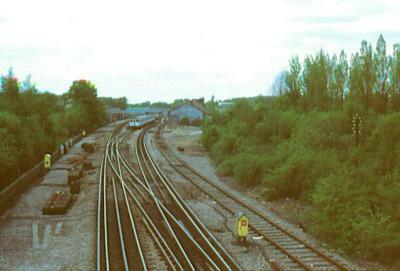 Note the goods loop line and the old goods shed in the background. 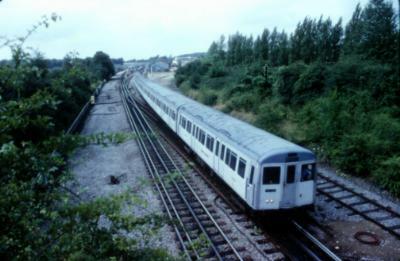 Prior to the introduction of the Class 165 turbo DMUs, British Rail / Network South East had to draft in a variety of stock for the Marylebone Aylesbury services owing to a lack of serviceable units from the previous fleet. 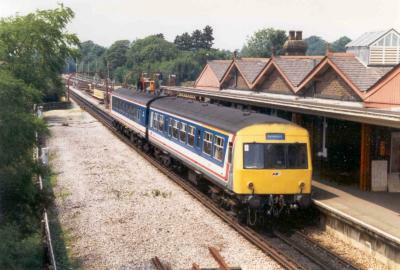 A two car DMU heads for Aylesbury from platform 1 at Amersham.